When you want floor dusting made easy use: Aluminum Flat Mop Pad Holder with Velcro Strips hold to Mop securely in place. 2 Velcro strips run the length of the frame. Compression nut secures handles up to 1" Diameter. Lightweight non-magnetic aluminum construction. Flat profile slides easily under furniture and equipment. Choose from a variety of Microfiber Pads in the same length on this website: Fringe Duster, MicroMop Maintainer, MicroMop Scrubber, or Microfiber Dust Cloths. 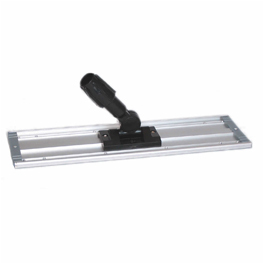 Aluminum Flat Pad Mop Holder with Velcro Strips has a Low Profile and a Tight Hold for the Cleaning Pad.